All four hotels were different and had different feeling. The Grand Pacific Le Daiba hotel was my favorite, it was very classy. The Hamanako Royal hotel was unique and a great experience for me. The meals were quite delicious. A lot of soups and sushi. Breakfast was just about the same every morning but food is tasty. I would have chosen "excellent" is there were more variety to eat. Our tour guide (Ms. Sachiko Tanaka) was very helpful. She is a very nice person and a good listener. Always tries her best to fill full all requests and needs. All sights were much better than I have expected. They were all beautiful and I got to take lots of pictures. I wish we had more time to stay at those sights, but I wish come back to these sights again hopefully in the near future. Bright color lanterns, music in the air, dancing in the street, and food vendors on every corner can only mean one thing: festival time. 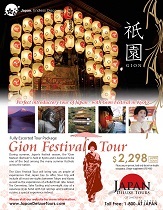 The Kyoto Gion Festival stretches for the month of July, climaxing with a parade of 32 floats that can measure up to 25 feet tall, weighing 12 tons. 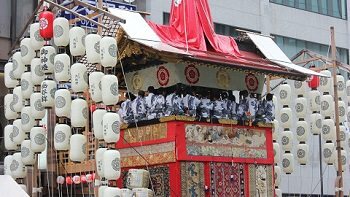 It is easily consider the largest and best festival in Japan.